Electroluminescent materials are substances radiating visible light under the electric field. They are used for night, advertising and emergency lighting, as well as for demonstrating sign-related and graphic information. At the moment, the most interesting use of the light sources on the basis of electroluminescent materials is backlighting of liquid-crystalline displays (LCDs) in mobile electronics. Main advantages of such sources of light are low energy consumption, light weight, resistance to impact and no mercury. Not very long ago, when mobile phones had black and white displays, for their backlighting sources of light on the basis of electroluminescent materials with green, blue, and orange colours of lighting were widely used. Main problems that limit the use of electroluminescent sources are difficulties with receiving luminescent material with white lighting, necessary for backlighting of coloured displays, and insufficiently high brightness and stability of electroluminescent material properties. This problem is being solved by employees of the department of Theory of Materials Science of St. Petersburg State Institute of Technology (Technical University). “Improving characteristics of electroluminescent materials, first of all, raising its brightness and stability requires using complicated contemporary technologies. We have to use special technologies: coating electroluminescent material particles with nanosize films of different substances (so-called “capsulation”); modification of original components and finished electroluminescent materials by different means (electron beam, plasma, impact wave, and so on). All these things certainly complicate technology of production electroluminors, but it substantively improves their characteristics”, – explains Vadim Vladimirovich Bakhmetiyev, PhD in chemistry. “Important characteristic of luminescent materials is their dispersity, that means, distribution of particles according to their size, also, fractional composition and form of particles. Receiving electroluminors of necessary dispersity requires using original components with special sizes of particles. In order to do that, pre-processing of original substances is applied: grinding and selecting necessary fractions by means of sifting. Therefore, it is important that resolution of the received microphoto was enough for determination of particle size and conducted of the research”, comments Vadim Vladimirovich. In order to control dispersity of finished luminors and original components for them, employees of Technological Institute for a long time have been using optical microscope, and received digital photos with the help of the video eyepiece HB-35. Photos had comparatively low resolution (640×480 points), that is why another choice of equipment was needed. For further researches, Vadim Vladimirovich Bakhmetiyev chose Altami USB 3150R6 1/2 CMOS videocamera and Altami Studio 2.0 program. With the help of this equipment, photos with 1024×768 and 2048×1536 resolutions are made. It is possible to see that by using of maximum Altami camera resolution total magnification with videocamera increased by 2.7 times in comparison with video eyepiece, which allows to analyze more finely divided powders than earlier. Practical implementation among electroluminescent materials is connected with zink sulfide electroluminophor (ZnS:Cu) mostly. Unlike usual luminescent materials, electroluminescent materials have greater concentration of copper. In order to change the qualities of luminescent materials (for example, increase brightness or change the specter) coactivators Mn, Ag, Pb, Sb, Ga, Al, Cl are introduced into it. Electroluminescence material ZnS:Cu is zinc sulfide activated by copper. It has blue-green colour of lighting (author’s note – Electroluminors presented at the photos were synthesized by postgraduate student Konstantin Aleksandrovich Ogurtsov who works under the supervision of his academic advisor, PhD in chemistry, chair of the department of Theory of Materials Science of St. Petersburg State Institute of Technology (Technical University) Sychyov Maxim Maximovich). As some particles are large and the depth of field of the microscope is sometimes not sufficient, for receiving the accurate photo Multifocus method of Altami Studio program is sometimes useful. From several microphotos (pictures 3,4,5,6), made with different focus of the microscope, with this method one sharp photo of electroluminescent material was received (Picture 1). “Then with the help of Find contours method in Altami Studio program I was able to find distribution of particles according to their sizes. As all micrographs were made at the calibrated application and contain calibration, we can assess the size of particles”, – informs Vadim Vladimirovich. Perimeter of an average size particle in the microphoto of the finished electroluminescent material ZnS:Cu is 23.23 microns, and its area is 37.6 squared microns. In the same way of the department of Theory of Materials Science of St. Petersburg State Institute of Technology (Technical University) electroluminescent materials ZnS:Cu,Mn, containing 0.8 mass % and 1.2 mass % of manganese were received. These substances have orange colour of lighting. Perimeters of the average size particle in the micrograph of the finished electroluminors ZnS:Cu,Mn (0.8%) and ZnS:Cu,Mn (1.2%) are 35.19 microns and 61.12 microns, and the area — 80.08 squared microns and 229.1 squared microns respectively. 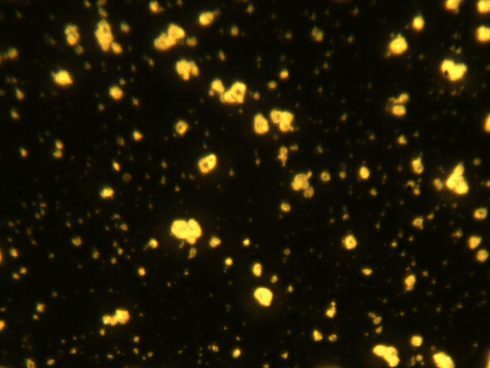 “In the received micrographs one can clearly see that the samples activated by manganese have larger particles than samples activated by copper. It is explained by the fact that luminescent materials containing manganese are synthesized by higher temperature and during the longer period than luminescent materials containing only copper. And the higher is the temperature, and the longer is the synthesis process, the larger grow luminescent material crystals. It is important by electroluminors examination”, explains Vadim Vladimirovich Bakhmetiyev. Creating of the technology allowing to increase the brightness and stability of electroluminors properties, as well as working out the technology of receiving electroluminors which has the white lighting colour are nowadays main goals of the research.